January 16, King of Prussia, Pa. – Results from a national and regional business trends survey show 83% of employers in this region believe their organizations will see an increase in sales/revenue in 2015 as compared to 2014. This is an increase from 74% surveyed at the same time last year. Nationally, 75% of employers share this view. Moreover, 94% of the national participants expect the overall economic outlook for 2015 to be the same or better than 2014. These results are from the 2014 National Business Trends Survey, conducted by the Employer Associations of America and include regional results among members of the MidAtlantic Employers’ Association (MEA). This survey included responses from approximately 1,360 mid-sized employers (less than 1,000 employees), including 254 total employers from the Northeast Region. “Overall, employers in our region continue to be optimistic about their growth and new hiring for 2015 with more than 57% planning to increase staffing levels while 36% plan on maintaining their staff levels by filling any open positions,” according to Kevin Robins, CEO of MEA, a member-based association that provides HR, training and development and recruiting services to mid-sized employers in Pennsylvania, New Jersey and Delaware. Of those hiring, 75% said they will be hiring to fill newly created jobs while 70% will be replacing staff due to turnover. On Friday, January 16, noted national and regional economist Joel Naroff, of Naroff Economic Advisors, joined MEA at its Member Event announcing the results of the survey. He commented that the strengthening in hiring and the tightening in the labor market that was seen in 2014 would likely accelerate in 2015. Barring another brutal winter, economic growth should be well in excess of 3%. So far, wage gains have been kept down but labor shortages are already appearing in a variety of regions, industries and occupations. With additional strong payroll gains and falling unemployment rates, it is only a matter of time before the expected increases in wages appears. The risk is that when the compensation dam breaks, there may be a surge in wages. Retention should be a major focus of attention now if labor costs are to be controlled this year. During 2014, 29% of respondents in the Northeast region increased their training budget and 44% plan to increase their budget in 2015. Employers identified the following as the most difficult positions to fill or retain: professional staff (45%), skilled production workers (44%), and high potential managers (34%). These regional trends correlate to the national trends. The survey also identified the following strategies being utilized to address these shortages: additional training and development for existing staff (56%), filling jobs with existing staff that lack the necessary job skills but that have potential (46%),and an increased focus on retention strategies for positions where recruitment is difficult (51%). Notably, 42% of employers have increased pay ranges while 40% are increasing starting salaries. This is up from 35% and 30%, respectively, last year. According to the survey, 20% reported a significant increase in sales/revenue in 2014 compared to 2013, while 48% reported a slight increase in revenue in 2014 over 2013. For 2015, 21% expect a significant increase in revenues while 62% expect a slight increase. 84% of employers increased wages in 2014 and 81% anticipate increasing wages in 2015 while 45% plan on paying variable/bonus awards in 2015. During 2015, 48% of employers plan on increasing their recruiting emphasis with 52% planning to hire in the 1st quarter and 58% planning to hire in the 2nd quarter. Only 21% have no plans to hire at this time. In 2015, 52% of employers in the region are planning process improvements and 63% plan on investing in technology and 53% on equipment. In addition, 21% shifted a larger percentage of healthcare costs to employees in 2014 while 33% plan to shift a larger percentage of healthcare costs to employees in 2015. Nationally, an impressive 95% of the executives surveyed report that the economy in 2014 was about the same or better when compared to 2013. Similarly, they are optimistic about 2015 with 39% feeling that the economy will be better in 2014 with an additional 55% feeling that it will be about the same. Despite an optimistic outlook, employers are still focused on the following serious short-term (within the next five years) challenges to their businesses: competition (30%), cost of regulatory compliance (26%), skilled labor shortage (27%), professional/technical staff shortage (20%) and ability to pay for benefits (23). Only 6% of employers surveyed plan to freeze or reduce pay in 2015, down from 10% that planned to do so last year. This number is down significantly from the actual 19% that froze or reduced pay as cost-cutting measures in 2013. The Employer Associations of America’s data reflects national conditions. 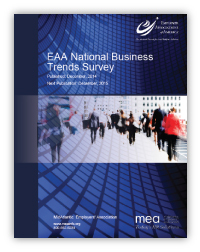 EAA surveyed a total of 1,417 companies from all 50 states in October and November 2014. The percentage of respondents and their respective industries include 43 percent from manufacturing, 6 percent from Professional and Business Services, 7 percent from Health Services, and 44 percent from other industries. The survey also represents companies of all sizes: 1-99 employees (53%), 100-249 employees (27%), 250-499 employees (12%), 500-999 employees (4%), and 1,000+ employees (4%). For a full copy of the National and Northeast report, go to www.meainfo.org. The Employer Associations of America (EAA) consists of 33 regional employer associations that serve 35,000 companies and more than 6 million employees. The EAA’s mission is to advance a national presence as well as the regional success of its members through collaboration, excellence and efficiency. The MidAtlantic Employers’ Association (MEA) is dedicated to helping growing businesses to stay current and compliant and to attract, develop, motivate and retain their workforce.